Reviewing this makes ME feel like an alien. Without a doubt, I have grown more as a reader since I started doing CBR a few years ago than in my entire 20+ years reading before it. It’s still comforting and thrilling to read books that are exactly the reason I love to read, but going completely outside of my genre is a different kind of experience. Fulfilling. I read Cannonball reviews (along with Pajiba and every other blog or news source I follow) through Feedly, and my only “rules” for myself are that if the review piques my interest, I add it to my reading list. Then I randomize my next book from my 25 page Goodreads to-read list, and once I land on it, I have to read at least 20 pages or so before I can give up on it. And that’s how I ended up here, in the weird position of trying to review Childhood’s End. It is wildly outside my wheelhouse, and I have no frame of reference whatsoever to assess it. 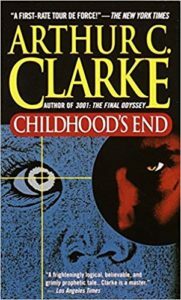 No idea what other books Arthur C. Clarke has written, no idea how this one stacks up to similar books, no idea how it was received when it was published or how people see it now. It’s weird. All I can say is that I didn’t love it but I liked it, I felt like it had a little bit of an anti-socialist undertone, and it’s a little bit hard to suspend disbelief and marvel at the technological wonders of an alien race that is decades behind where humans are now. It seems more quaint than scary a lot of the time, but that does make it even more chilling when it hits the tone that it must’ve been hitting throughout the book in 1953. I’d be very interested to see the modern update, which I didn’t realize was a thing until it turned up on Amazon when I went to grab the link for the book. How is it? Was it? Is it still running? Is it good? Share the post "Reviewing this makes ME feel like an alien." Mom to a wild-haired four-year-old spitfire. Wife to a nurse. I spend my days tripping over dogs and putting out fires. I love hearing that CBR has helped readers grow! And I think you’re spot on with this review. A lot of Clarke’s stuff has the same vibe, and for me, a lot of it is “liked it/not loved it.” Is the modern update the one with Tywin Lannister as the alien? If that’s the one I’m thinking of, I didn’t finish it. Oops. I feel like a bad sci-fi fan! Good for you for expanding your reading horizons, though.